Kingsbrook Animal Hospital veterinarian, Dr. Davis, and his family recently adopted an adorable puppy they named Molly! When he brought her to Kingsbrook to meet us, we couldn’t help but take the opportunity to ask him a few questions. Melissa: Congratulations on your adoption of Molly! MD: Thank you.. we really got lucky with her! Melissa: What led you to the decision to adopt a dog? Melissa: Haha! Did you do any research to help you decide what kind of dog would be a good fit for your family? MD: We have small children and live near water, so we were thinking about a medium to large dog that liked to swim & would be more tolerant of children. The rescue group suspected that Molly was a labrador mix, but it turns out she is mostly golden retriever, despite her coloring. We expected her to be larger, too, but we are very happy that it seems she will only weigh about 30 lbs when she is full grown. MD: Molly has lots of things she loves to do. She loves the kids, especially when they drop food from the table, she also loves to swim and chase her ball. Melissa: And her least favorite? MD: Her least favorite thing is getting into the car, even when it’s to go somewhere fun! We are working on that & she already seems to be less reluctant to hop in with us. Regardless of not yet loving car rides, all of our KAH family could agree that Molly is a very lucky girl. We are so happy for Dr. Davis and his family! This entry was posted in Adopt-a-Shelter-Dog Month, Adoption, adoptions, Adorable pets, Best Friends, Frederick MD, Kingsbrook Animal Hospital, rescue, veterinarian and tagged Adoption, Dr. Morse Davis, DVM, Frederick, Frederick MD, Frederick MD Vets, Kingsbrook Animal Hospital, MD, Veterinarian, Veterinarian in Frederick MD on June 23, 2015 by yourfriends. When I was seventeen, my parents gave me permission to get my first dog. I knew I wanted a young, adult dog, a dog that would be good with cats (we had four at the time), and a small to medium sized dog. I wasn’t sure what breed would be the best fit, but I knew I wanted to adopt a dog from a rescue or shelter. So, I began my research and journey to find the perfect dog for me. I read up on all kinds of breeds of dogs and their general temperament, grooming needs, and trainability. Once I had a general idea of what breed would be a potential match, I started searching the internet for rescues and shelters that were located close to me. Then I came across Petfinder.com. Petfinder.com allows you to search all rescues/shelters from all over the country. You can search by your zip code and distance and narrow your results by the type of pet you want, their breed, age, and gender. You can additionally search for pets that are housebroken, declawed, have special needs, and the rescue/shelters tell you if the pet is good with children and other pets. Petfinder.com shows you pictures and descriptions of each pet and also has helpful articles to read and resources to check out. After looking on Petfinder.com for a few months, I found a dog whose picture melted my heart. She was perfect in every way and was located in Harrisburg, PA. I quickly contacted the rescue and set up a time to go meet her for the first time. When my parents and I pulled up to the rescue, Jamie (then named Connie), was waiting for us outside. We took her home that day and she’s been my little fur-baby ever since. Here is a picture of little Jamie! If you are looking to rescue a pet, I would highly recommend using Petfinder.com to aid in your search. If you have questions about adoption, our team at Kingsbrook Animal Hospital would be happy to help in any way we can. We are located in beautiful Frederick, Maryland. This entry was posted in Adoption, adoptions, Frederick MD, Kingsbrook Animal Hospital, Petfinder, veterinarian and tagged Adoptable Animals, Frederick, Frederick MD, Kingsbrook Animal Hospital, MD, PetFinder, rescue animals, Veterinarian, Veterinarian in Frederick MD on June 9, 2015 by yourfriends. As much as this thing we call the Internet has changed the lives of humans all over the planet, it’s had perhaps an even greater impact on another, slightly furrier species: shelter pets. The Internet has connected millions upon millions of lonely shelter puppies and kitties with forever homes, facilitated a boom in pet fostering, and changed the way we look at adopting pets altogether. One of the adoption innovators responsible for this shelter pet revolution is none other than Petfinder co-founder Betsy Saul. As part of our coverage of Petfinder’s Adopt the Internet Day (March 15), Paw Nation got the chance to chat with Saul about Petfinder’s humble beginnings, the joy of rescuing pets and the letters she gets about some of the 17 million animals that have been adopted through Petfinder. Petfinder.com has been going strong since 1996. Can you give us a little history of how the whole Petfinder phenomenon came about? When Jared Saul, my ex-husband, and I started Petfinder 15 years ago, we never dreamed it would be as powerful as it turned out to be. I remember hoping that we could save at least one life a month. And I remember fantasizing about being able to do it as a part-time job — and really give it the attention it deserved. This year we expect to help find families for 2.5 million pets and there is a whole team of people working full-time to make sure we meet our goal to end the euthanasia of adoptable pets. We thought that if only people knew about the vast amount of love waiting in shelters — the loyal companions just waiting to be chosen and taken home — then we would increase adoptions and be able to stop killing pets simply for lack of a home. Nobody wanted to euthanize so many pets, but folks just weren’t going to the shelters to adopt and there was a seemingly endless tide of unwanted animals. 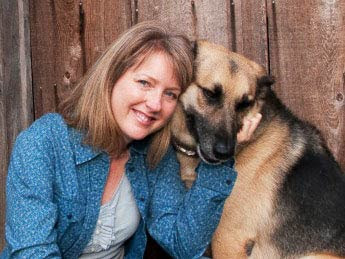 When we started Petfinder in 1996, it is estimated that the U.S. was euthanizing more than 16 million pets in shelters. This year, that number will be less than 4 million — still too high, but amazing progress by the animal welfare community in 15 years. There are about 325,000 pets posted from more than 13,500 adoption organizations. What was the goal of Petfinder in the early days? How did it change? Our focus has always been on adoption and more support is needed for fostering and adoption. To try to muster enthusiasm for their plight, we’ve launched initiatives that keep everyone’s eye on homeless pets. From turtles and barnyard animals, to cats and dogs, we will continue to bring them into your living room, office, and iPhone. Even the more beleaguered get their own celebration, like Adopt-a-less-adoptable-pet Month in September. These days, we’re not only about showcasing homeless pets. We also work to help make sure that once they are adopted, that family is their “furever” home. And that they really are a part of the family. How do we keep pets out of the shelters and in their homes? We’ve launched FurKeeps, a program that focuses on reducing the number of pets going into the shelters. FurKeeps has three parts. We promote microchipping and registration of the microchips, so when pets get lost, we can help them find their way home. For this we’ve partnered with HomeAgain. We ask people to get pet health insurance, because no family member should be abandoned or euthanized because his pet parent can’t afford medical treatment. For insurance, we’ve partnered with PetFirst. Finally, we ask people to train their pets (yes, cats too!) with positive training techniques that feel like play and forge an unbreakable bond. Do you have any tips for prospective pet parents to make the best adoption for their lifestyle? Yes! Take stock of your lifestyle and be honest with yourself and the adoption group about how much time you want to devote to a new family member and how you want to spend that time. Do you want a running companion? Do you want a couch potato when you come home from work? (There’s no shame in that and a lot of pets who’d be happy to oblige.) Go to Petfinder.com and check out the Before You Adopt videos on the right side of the home page. What’s your proudest achievement when it comes to PetFinder? My favorite part of Petfinder are the e-mails that come in from happy adopters that say (and this is very, very common), “I thought I was going to the shelter to save a pet and it turned out that she was the one saving me.” Pets play such an important role in our lives. They greet us first when we walk in the door, they love us almost unconditionally, and they get us outside of ourselves — which is all very healthy. Pets actually make us healthier. I love it when we hear that one of our Petfinder pets changed someone’s life. Here was an animal that nobody wanted who has now shown us the power of friendship, love, companionship, and on and on. After 15 years, it still gives me goosebumps. This entry was posted in adoptions, Petfinder on March 21, 2012 by yourfriends.